Western Buddhism, with its introspective emphasis on personal liberation, has been criticised for its tendency to degenerate into narcissistic escapism, playing into the hyperindividualistic society bred by industrial capitalism. However an authentic practise of the Buddha’s Dharma* is inherently radical, cultivating a turning towards the suffering of others as well as our own – including suffering at a societal and global level. 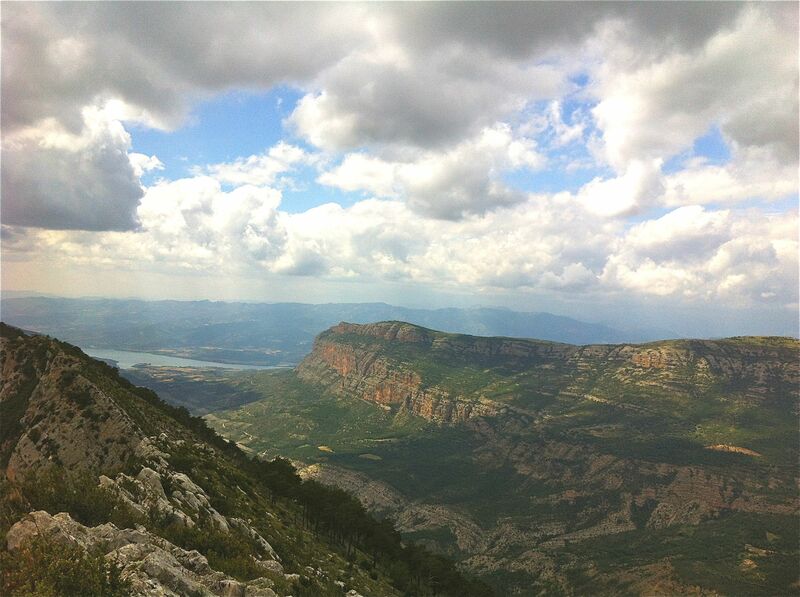 ‘We are living at the tail end of 30 years of socio-economic political policies which have generally pushed society towards increasingly individualistic values and away from community cohesion, and with consumerism and its dependence upon image, towards a sort of narcissism as well,’ says Dharmachari Guhyapati, founder and director of the Ecodharma retreat centre in Catalunya, Spain. 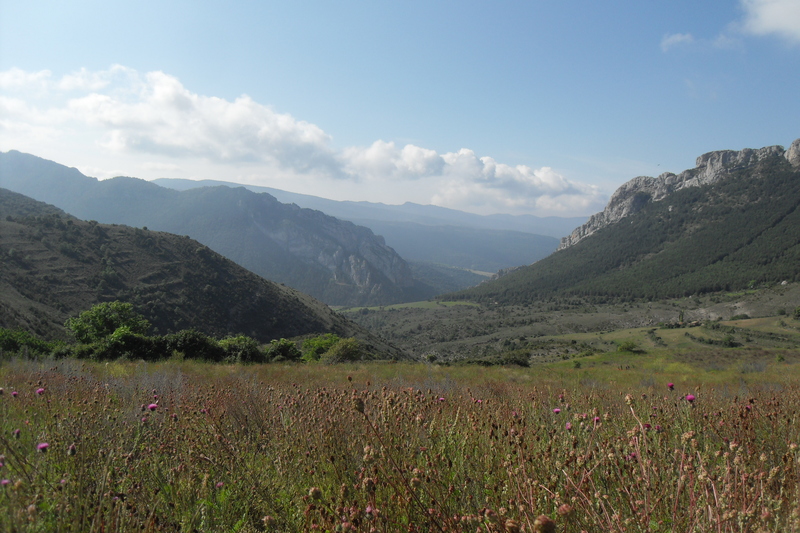 Situated in a wild and stunning valley shouldered by dramatic limestone ridges in the Catalan Pyrenees, the Ecodharma centre seeks to explore this critique. The centre is unique in its bringing together of the spiritual, political, ecological and social aspects of modern Buddhist practise. Underpinning its work is the conviction that the integration of inner work with outer engagement is the basis for a radical response to our times. 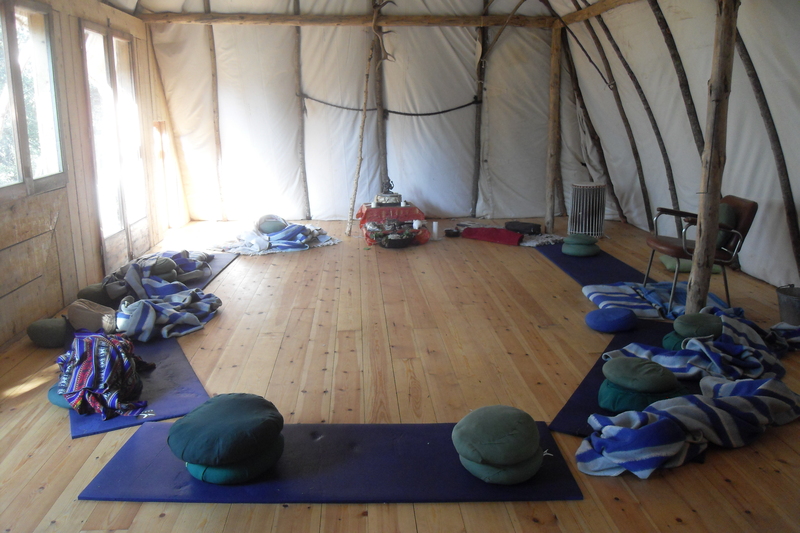 The centre has been running retreats and courses for five years, combining Buddhist teachings and practices with those of wilderness immersion and deep and radical ecology. Retreats include a ‘Wanderers Retreat,’ involving two weeks of nomadic wandering through the wild landscape surrounding the centre; ‘Meeting the Wild’ brings meditation and mindfulness into relationship with wilderness immersion; the ‘Vihara Caves’ retreat offers a unique opportunity to spend time meditating and sleeping in the many caves that penetrate the limestone of the area; and ‘Permaculture and Deep Ecology’ combines practical permaculture skilling with nature connection and mindfulness practise.These retreats are rooted in the ‘nature-based practise’ that has been developed at the centre, which draws upon the transformative and integrative power of immersion in non-human nature. Participants are encouraged and supported to spend time out in the wild, connecting with the teachings nature offers. A new addition for 2012 is the ‘Engaged Buddhist Training’, an intensive two-week course exploring the integration of spiritual practise and social engagement. Spanning the personal, interpersonal and wider social dimensions of an engaged practise, the course includes everything from emotional resilience training and working with personal blockages to workshops on strategy and analysis tools, holding effective meetings, creative campaigning and fundraising for projects. ‘The Engaged Buddhist Training seeks to offer people with a Buddhist practise tools that can support their engagement with socio-political issues,’ says Guhyapati. Doing so almost always involves working with other people, so there’s a focus on tools to help us do that effectively, such as facilitation skills, decision-making processes, understanding power dynamics and transforming conflict into useful dialogue. As well as specifically Buddhist teachings and practices, the course’s exploration of the inner work draws upon Joanna Macy’s ‘Work that Reconnects,’ exercises designed to empower by helping people to connect with their feelings about the unprecedented ecological and social issues we face today. According to Macy, these feelings, such as despair, fear and anger, are often repressed, leading to apathy and disempowerment. Allowing them to be fully acknowledged and expressed means their power can be harnessed for action. Before completing the Engaged Buddhist Training, Julia Gutbell, from Frankfurt in Germany, felt unable to do anything about the problems she saw in her city, overwhelmed by information, inner turmoil and feelings of inadequacy. She says that working through these emotional blockages during the training has empowered and inspired her. Dharmacharini Kalyanavaca, a practising Buddhist since 1978, found the practical tools offered in the training particularly useful to help her engage more fully with her local area of Bethnal Green in London. ‘The work that we did in forming communities, and the discussions around group agreements, was particularly useful in helping me to analyse a serious case of disharmony in my Transition group. The work on exploring power and group dynamics was similarly useful. These aspects have already proved very worthwhile since my return home. While the Engaged Buddhist Training is aimed more at people practising Buddhism and wanting to find a way to engage, the ‘Sustaining Resistance’ courses work largely with those already involved in radical organising, grassroots community development and direct action who want to gain skills for the inner work necessary to support their action. The project, which has been running for a few years now, grew out of an awareness of the emotional toll taken on many people heavily involved in bringing about positive social change. At different times during her life, Lina, a radical environmental activist from Germany, has been too focused on inner work or outer action. She says that the Ecodharma centre has helped her to strike a balance between the two dimensions, and bring the tools she has learnt back to the community of radical activists she lives in. After a period of burnout from focusing too much on outer work, she spent some time practising vipassana meditation at a retreat centre in Germany, but found the attitudes of some people there difficult to accept. ‘People would say that you don’t change the world with action you do it by changing yourself and your immediate environment by being a beautiful person. But people were flying from centre to centre saying “Oh yes, I’m developing myself and the world, these retreat centres are so nice I’m just going to fly and visit them all.” And I just thought that couldn’t be right.’ She then returned to environmental activism. The Sustaining Resistance project has proved to be a great success, with workshops and courses held throughout Europe over the past few years. Courses are always oversubscribed. Within one week of announcing a recent workshop near Berlin, 100 people had applied for the 20 available places. The Ecodharma team are hoping to develop the project further by providing ‘training the trainer’ workshops to enable the work to be shared more widely. For the team at Ecodharma, an important part of expressing their ecological values is through exploring relocalisation and bioregionalism. The centre has fostered good relationships with the local area and is involved with various local projects such as co-operatives supporting organic farming. A successful recent project was the ‘School of the Grandparents,’ which involved harvesting the wisdom of the local elders who hold a lot of local knowledge about growing and sustainability – methods used before the arrival of fossil fuel dependency. Other relationships extend into the wider region, including good links with projects in Barcelona. In partnership with a social centre in the city, two forest gardens will be planted this winter – one there and one at Ecodharma. As well as running retreats, courses and outreach projects, Ecodharma is also home to a community of practising Buddhists. All community members help with the running of the centre, which can include anything from tending the fruit and vegetables in the permaculture garden and cooking food for retreats, to managing volunteers and facilitating courses, as well as the many day-to-day tasks of running a retreat centre and living in a remote location. In line with their ecological and Buddhist values, the community try to live as simply and sustainably as possible. Power is provided solely by the sun, which also heats the fresh spring water for washing. All of the food is vegan, and community members live in low-impact structures such as yurts or benders. Currently there are five permanent community members, plus a regular flow of long- and short-term volunteers. It is hoped that this will increase in the near future; the team have estimated that nine permanent residents are necessary to run the centre optimally, and are looking to attract new community members. Work is currently under way to provide the infrastructure necessary to support this growth, and to develop more sustainable living systems – this winter will see the planting of a forest garden, and plans for a fuller permaculture plan are in the pipeline too. The community also hope to continue developing the retreats and courses, particularly those focusing on nature-based practise, engaged Buddhism and sustainable activism. Through this work, they hope to help contemporary Buddhist practitioners to connect more fully with the current socio-political context, and to enable people to explore how they might integrate the inner and outer work necessary for a full and authentic engagement with the world today. ‘If we want to be of benefit to the world, we need to do the inner work that provides us with the wisdom and resources to do that effectively,’ says Guhyapati. ‘And if we want to practise authentically we require engagement with the world, to generate the creative tension in our lives that can help us to really grow. Engaging with that context requires dialogue. What is an authentic Buddhist response to the multiple crises we see unfolding in post-modern society? Central to Buddhist practise is the transformation of greed, hatred and ignorance, so how do we respond to the institutionalisation of these poisons in our economic systems, militarianism and mass media? As ancient Buddhist teachings merge with contemporary culture and society, a new expression of practise must emerge. A practise that is fully engaged, fully alive to our times and as radical as the Buddha called for.